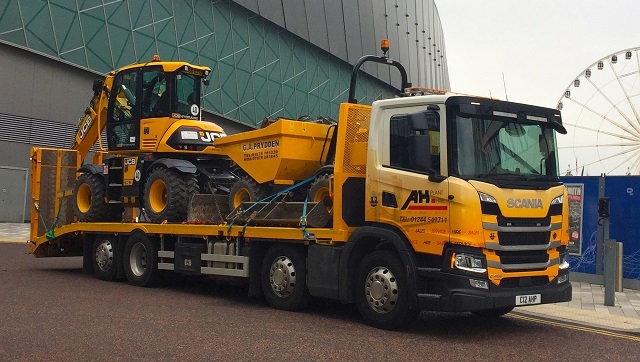 Chester-based AH Plant Hire has taken delivery of a new bespoke-built Andover Trailers plant body, an upgrade for the company’s original Andover build, which entered service 14 years ago and is still in operation today. AH Plant Hire’s new 32-tonne Scania with bespoke-built Andover Trailers plant body is an upgrade for the company’s original Andover build, which entered service in 2004 and is still in operation today. The new body, mounted to a 32-tonne 8×2 rear steer Scania G450, joins two other Andover-built plant bodies in service with the company, mounted to a 2010 17-tonne 4×2 Mercedes-Benz Atego and the original 2004 26-tonne 6×2 Scania. Despite its age, the 2004 Scania isn’t being retired from service, as both truck and body are still in excellent condition. The new Scania is a fleet addition brought in to help maintain the continued growth of the business, providing AH Plant Hire with a bigger truck offering more flexibility and the ability to move larger loads. The new body boasts Andover’s trademark low-profile deck, which sees the cross members transect the body runners, rather than simply sitting on top. It also features a double crank beavertail connected to a pair of 2.8m long hydraulic power toe, knife edged ramps, alongside a hydraulic winch to aid loading and unloading and 10 pairs of lashing points on the deck for maximum load security and flexibility. The combination of the double crank beavertail and longer ramp length creates a shallower load angle, helping to improve safety when loading and unloading. Safety was also at the forefront of AH Plant’s decision to include additional lighting under the bed and inside the toolboxes, helping to make operation at night as safe as possible. “The ability to develop a plant body to our specific requirements is what makes Andover stand out from its competitors – that and the fantastic level of customer service we have received from them since day one. It sealed our decision to remain loyal to Andover with this latest order,” Heaton adds. AH Plant expects the new vehicle to remain in service for around six years, it will be on the road six days a week, clocking up close to 75,000 km a year. 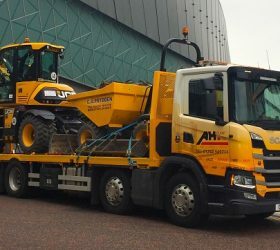 AH Plant specialises in plant and equipment hire, as well as plant repair and transport services, to an extensive customer base across the North West of England and North Wales.